Patrick's father was a leader in his community and was named Calpornius. He was a deacon in the congregation they attended in Wales. Calpornius' father--Patrick's grandfather--was named Potitus and he was a priest in the area where they grew up. He offered the sacraments and mysteries of the Church to those who had ears to hear and eyes to see. Patrick had roots within the Church and found himself drawn to the ministry that his father and grandfather had likewise felt themselves called to. He was receiving an education that would likely end up with him becoming yet another member of his family in service to the Church when one day he was kidnapped by Celtic bandits and slavers on the Western coast of Wales. They forced him into chains and carried him back aboard their ship so that they might force young Patrick--only sixteen years old--to work for the highest bidder. In this case, he was bought by a man who made him a shepherd by trade. Patrick ended up on some lonely hillside--a stranger in a strange land--watching over sheep that were not his own. For his six years as a slave to Celtic leaders he was mostly in isolation on some verdant Irish hillside. Since he was alone as he worked he began praying to himself. He began with the prayers he had learned as a child and these expanded into his own spontaneous prayers. He sang songs and hymns to sustain himself as he spent many lonely night with only sheep and goats for company. Finally, he began to hear God speak of liberation and escape. He heard a voice saying he would soon be free. A few days later a voice told him his ship was waiting for him and so he fled from his master that very day. He traveled for some time and through harsh conditions until he arrived at a port in eastern Ireland (200 miles from the place of his captivity). He boarded the ship and finally returned to his home in Wales. They greeted him with joy and gladness and toasted his return but after the parties had faded Patrick came to the stunning realization that he had missed six years of his life. All of his peers were well into their professions and careers and he had fallen woefully far behind in his education. His dreams of becoming a minister like all of the others had been shattered aboard the slaver ship that had stolen him away.Patrick ended up in the home of family--a stranger in a familiar land--watching his friends go on without him. He didn't know what to do with his life but he couldn't shake the strong calling he felt upon his life. As he was adrift in his life and uncertain how he should continue he had a vision. In the vision a man named Victoricus came striding across the Irish Sea toward Patrick. In Victoricus' hands were many scrolls. Each scrolls was a letter--written to a certain person--and he was handing them out to those God had called to serve. Patrick waited eagerly in his vision and received a scroll titled "The Voice of the Irish." In it he heard the laments of the Irish people who begged the former slave to come back and bring the Gospel that taught love for enemies and forgiveness from all sins. He must have wondered if this wasn't a mistake to be sent back to the people who had enslaved him as a missionary. Yet, as he reflected upon the vision he became more and more certain that God was calling him to be a missionary to the Irish. So, he went--one of the first Christian missionaries to leave the Roman Empire. Patrick ended up in some foreign boat on his way back to Ireland--a stranger crossing the Irish Sea--following after a calling that God had given him. Patrick baptized thousands of people in Ireland as he brought his own particular style of preaching and teaching to them. He did not have the same education as his many peers and colleagues but he knew well the people he had been called to serve. He confronted Celtic warlords with bravery and courage knowing that they would respect him for it and want to know what faith he held that gave him such courage. 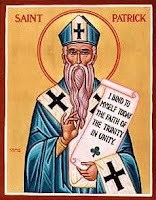 He brought the faith to the Irish in a way that mediated the sacraments and mysteries of the Church to a people unfamiliar with the history and symbols of the Body of Christ. 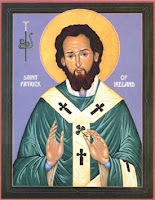 Patrick became the vehicle by which the grace of God was translated into Irish hearts. He ordained thousands and became a bishop missionary welcome in countless homes throughout the hills of Ireland. Patrick ended up in the land of his enslavement--a hero in a beloved land--watching over sheep that had become his own.